PLEASE NOTE: The Kernsville Dam area is CLOSED and marked NO TRESPASSING. This includes the Peace Rock area and the Kernsville Dam itself. The first parking lot is still open to the public for parking so that visitors may legally use the Schuylkill River Trail Bartram Section. 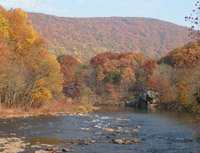 Boaters are allowed to use the river, aside from the area immediately before and after the dam. The Kernsville Dam and its attendant desilting basin was erected in 1949 to capture and remove coal silt from the river. The area has become an important wilderness area, boasting a variety of wildlife in the water, in the air and on the land. 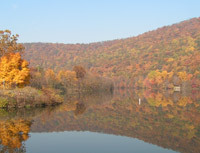 The Appalachian Trail, running from Maine to Georgia, tracks through its upper reaches and the John B. Bartram Section of the Schuylkill River Trail has a trailhead across from the Desilting Monument.